Honestly, don’t ask me. I didn’t come up with the name. I found the image on the right, cropped and reduced to post here, as part of the April image dump from the high resolution camera of Mars Reconnaissance Orbiter. The uncaptioned release dubbed this “Thumbprint Terrain in Northern Mid-Latitudes,” and it is obvious to see why. The cropped image on the right focuses in on the oval white mounds that really do look like some giant child was touching a soft damp muddy surface randomly with his fingers, leaving behind raised fingerprints as the mud stuck to his fingers as he pulled them away. Each white area seems to have a crater. 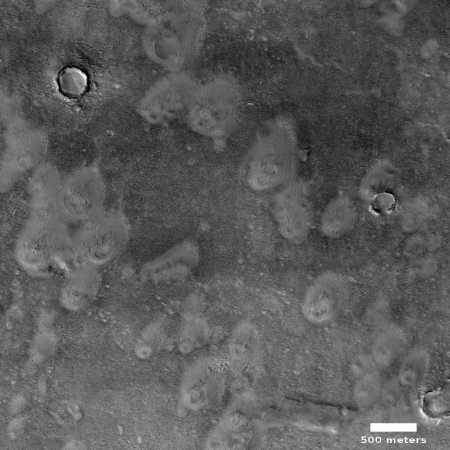 I suspect these are not impact craters, but possibly mud volcanoes, as each is at the top of a mound. My hypothesis is further strengthened by the location, which is deep within the low northern plains of Mars, a place where some scientists believe an intermittent ocean once existed. These mounds could have easily formed at that ocean’s floor, or thereafter when the land here was drying out. On the other hand, these could be from impact. Maybe they are scattered ejecta from a larger impact, landing here in a group on a wet muddy surface. The impacts might have concentrated the material around the crater, making it more resistant to erosion, which is why the craters now stand above the floor of the plain. On the third hand, all these theories could be wrong. Have any of your own? As I said in my last post in February showing recent pit discoveries on Mars, I could almost make this a monthly series. 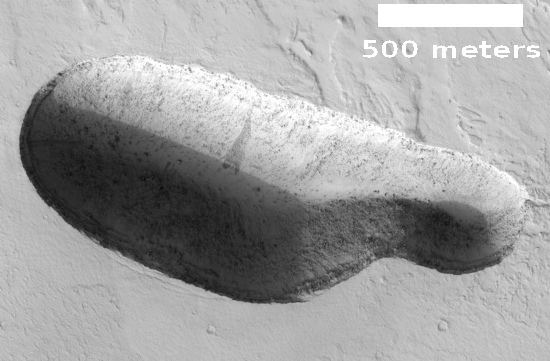 In the March image download from the high resolution camera of Mars Reconnaissance Orbiter (MRO) were three (maybe four) more pits, all likely skylights above lava tubes and all located near the giant volcano Arsia Mons in the region dubbed the Tharsis Bulge. The image to the right shows all three, with a possible fourth just northwest of pit #2 and visible in its full image. For the full images of the other two pits go here (#1) and here (#3). In all three cases, click on the “black & white map projected” link to see the full image with scale. The overview map on right shows where these three pits are located. If you compare this map with my previous overview maps from November 12, 2018 and February 22, 2019 you can see that while these pits are all found on the volcanic slopes surrounding Arsia Mons, they are all different pits. Moreover, the ten pits listed in these three posts are only a small sampling of the more than hundred already found. Whether these pits are deadend sinks or skylights into underground lava tubes that connect is at this point unknown. It would be a reasonable speculation to assume that some are deadends, and some link to extensive tubes of varying lengths. It would also be dangerous. Mars is alien. While the geology will be based on the same physical laws found on Earth, the lighter gravity is going to produce things differently. The three images above however do show some intriguing details. That is certainly what is is. However, layering suggests a regionwide process. The crater to the immediate northeast (the rim of which can be seen in the upper corner of this image), does not have the same kind of layering. (Be sure to click on the image to see that other crater.) 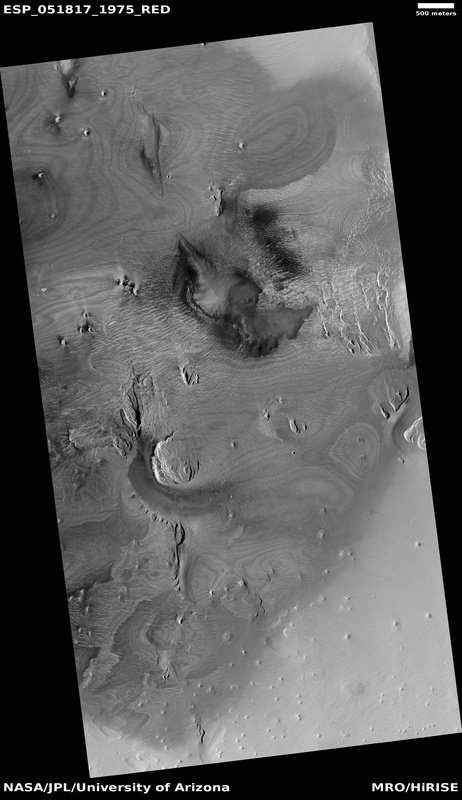 Its crater floor is instead a blob of chaotic knobs, with the only layering scattered in spots along its north interior rim. That the layering of both craters favors the north suggests a relationship, but what that is is beyond me. Prevailing winds? Maybe, but I don’t have the knowledge to explain how that process would work. It is not even certain that these two craters were formed by impact. They are located in the northern lowlands where an intermittent ocean is believed to have once existed, and thus might be remnants of that ocean’s floor. That they both have a muddy appearance reinforces this hypothesis, but once again, I would not bet much money on this theory. 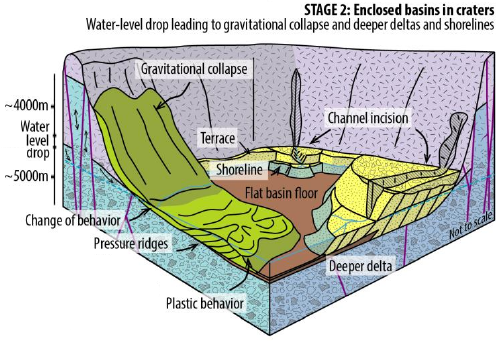 The features here could also be expressing the effect of an impact on a muddy seafloor. In either case the craters imply that the ocean that might have once been here existed a long enough time ago for these craters to form (either by impact or some other process) and then evolve. This has been a relatively dry place for a very long time. In the past month the science teams of both Mars Reconnaissance Orbiter (MRO) and Trace Gas Orbiter (TGO) have released images showing the strange layering found in Burroughs Crater, located near the Martian south pole. 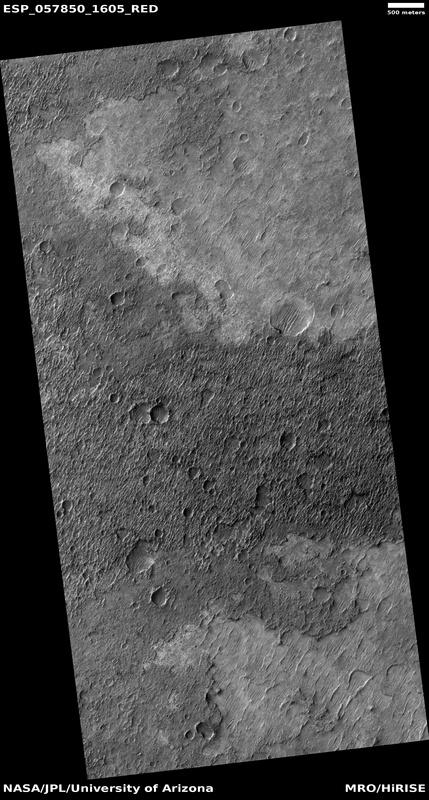 The top image above is the MRO image, rotated and cropped to post here. 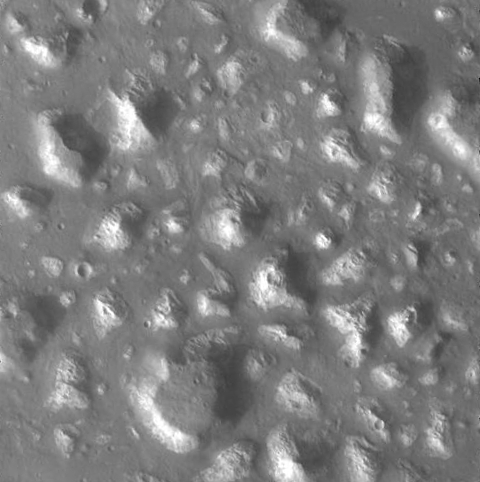 To the right is a cropped and reduced section of the TGO image. 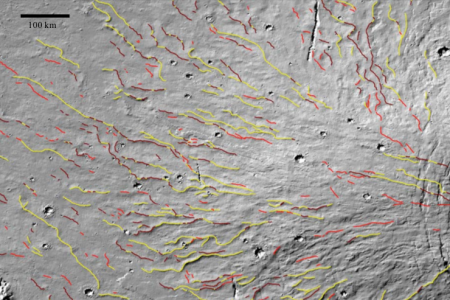 Numerous presentations at this week’s 50th Lunar and Planetary Science Conference in Texas have focused on two different changing features on the Martian surface, dubbed slope streaks and recurring slope lineae (or RSLs, an example of an unnecessary and unwieldy acronym that I avoid like the plague). I have highlighted the key differences. 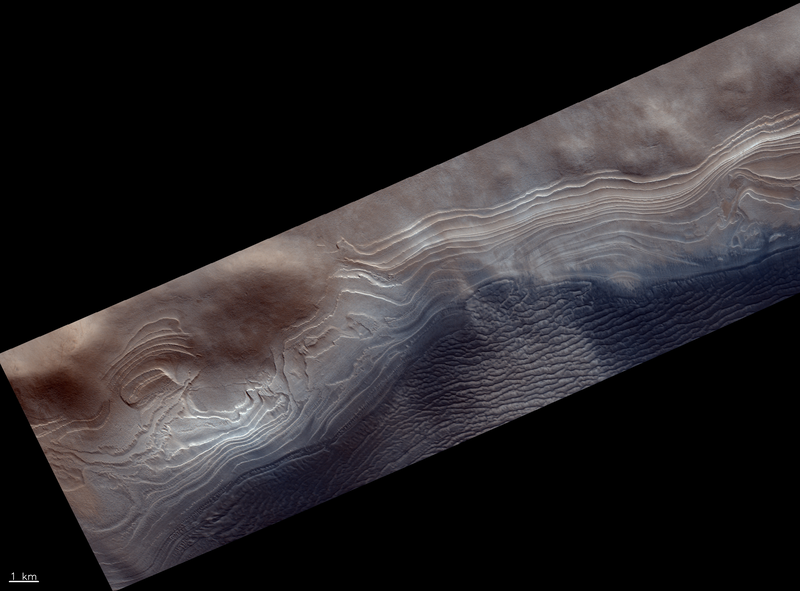 While slope streaks are long lived and change slowly, lineae change with the Martian seasons. And the slope streaks appear to exist at lower latitudes. 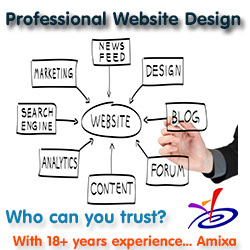 These difference means that the formation process of each must be also different. The problem is that scientists still don’t know what causes either, though they have many theories, involving both wet and dry processes. Most of the presentations at the conference this week focused on the recurring lineae, which I suspect is because of their seasonal aspect. 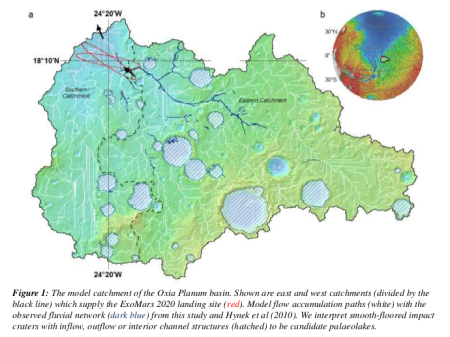 This feature strongly suggests a water-related source for the lineae, and everyone who studies Mars is always focused on finding sources on Mars where liquid water might be found. 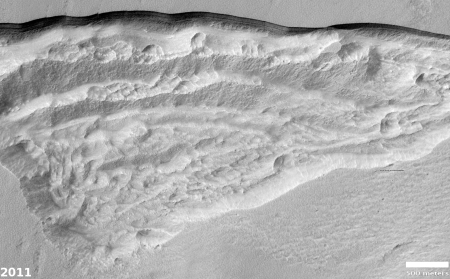 Also, slope streaks appear more often in dunes, which also strongly suggests a dry process. 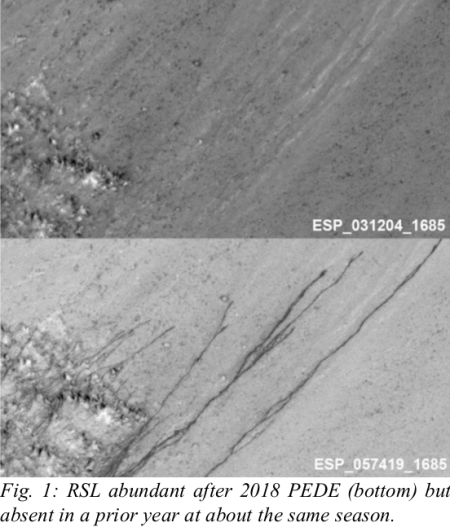 One paper, however, did a comparison study of lineae with one specific kind of dune slope streak to see if the freatures might be related. The term colles means hills or knobs. The hills appear brighter than the surrounding lowlands, likely due to relatively less dust cover. This is certainly a place with lots of hills, or to be more precise, mesas, as many of them seem to be flat topped. The lack of dust cover on the tops is probably because, like on Earth, the winds blow much better once you get a bit above the surface. (This is why sailing ship builders kept adding higher and higher sails to their ships, until the top sails of clipper ships rose a hundred-plus feet above the deck.) These better winds clean off the mesa tops, just as they did to the solar panels on the rovers Opportunity and Spirit several times during their long missions. 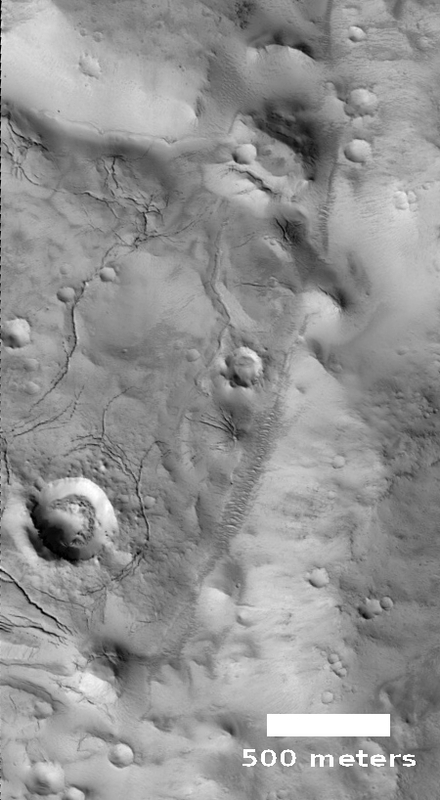 Ariadnes Colles is another example of Martian chaotic terrain. 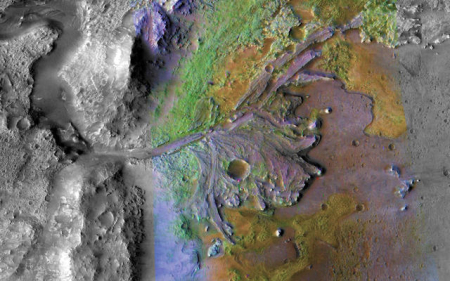 Since this region is located deep in the cratered and rough southern highlands of Mars, the erosion that created these mesas was likely not water-flows. Was it wind? Ice? Your guess is as good as anyone’s. More caves on Mars! This week the Lunar and Planetary Institute and the Johnson Space Center are jointly holding the 50th Lunar and Planetary Science Conference in Texas. I have been going over the program, and will be posting reviews of some of the more interesting results all this week. We begin with caves, which should not be surprising to my regular readers. As a caver who also knows their value for future space colonists, I am always attracted to new discoveries of cave passages on other worlds. Today’s however is a doozy. Though scientists have found some evidence of slow erosion and change on the Martian surface, it is today generally inactive. While the weak wind of Mars’ thin atmosphere continues to work its will, and the likely presence of underground frozen water acts to shift the surface shape as the seasons come and go, none of this happens quickly. Essentially, Mars is a quiet place. Once however catastrophic events took place, gigantic floods flowing down to the east from the planet’s huge volcanoes to carve out Marineris Valles, the solar system’s largest known canyon. As that water rushed eastward it ripped the terrain apart quickly, creating deep side canyons, drainage valleys, and chopped up regions now dubbed as chaos terrain, multiple mesas separated by numerous fissure-like canyons. 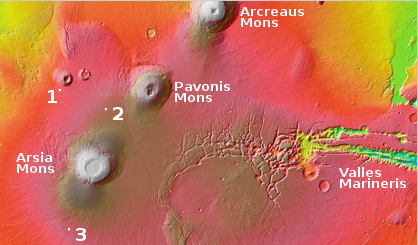 The overview map on the right shows Valles Marineris and its drainage to the east and north into the vast northern plains of Mars. 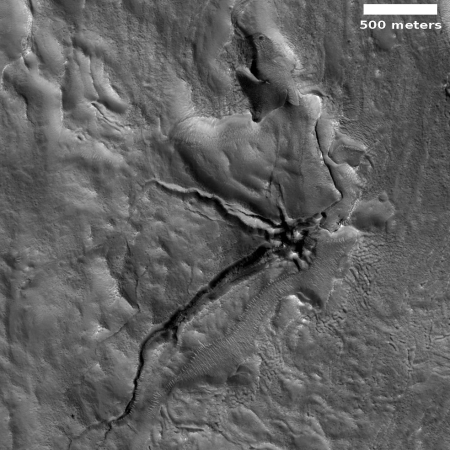 It also shows the location of one of the largest regions on Mars of chaos terrain, dubbed Hydraotes Chaos, located close to the mouth of this gigantic drainage system more than 2,500 miles long. 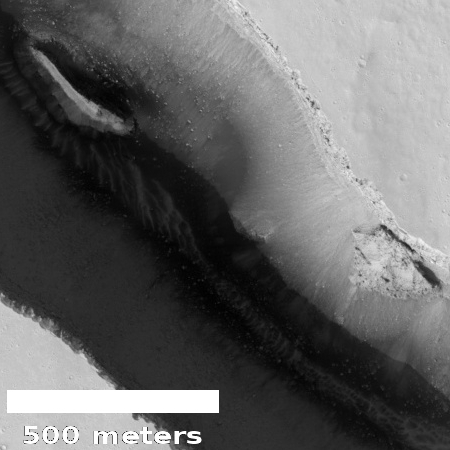 Recently scientists have used the high resolution camera on Mars Reconnaissance Orbiter (MRO) to begin taking images of the massive landslides on the face of the mesa north of Hydraotes Chaos that was hit directly by these floods. 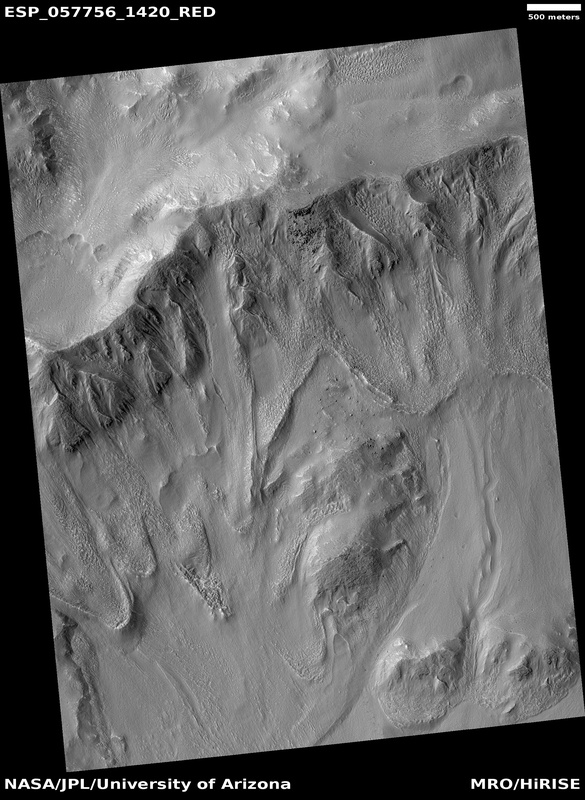 The location of the most immediately interesting of these landslide images is also indicated on this overview image. To the right is that image, rotated, cropped, reduced, and annotated to post here. The white boxes indicate two full resolution sections that I highlight below at full resolution. This image shows that full cliff. The total drop from the plateau at the top to the floor where Hydraotes Chaos is located to the south is approximately 8,200 feet, almost exactly comparable to the depth of the north rim of the Grand Canyon. The image shows numerous evidence of avalanches and erosion, both at its base and at its rim. None of these avalanches likely occurred during those catastrophic floods, but long afterward. 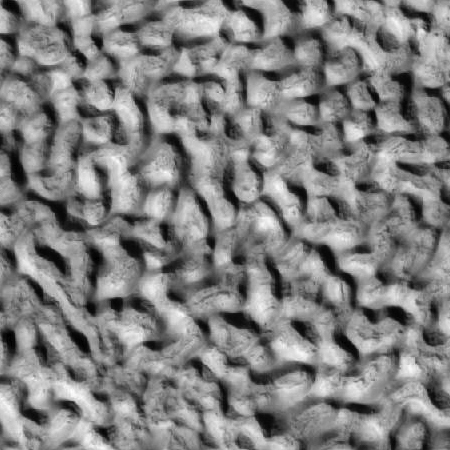 This bizarrely textured terrain may be directly related to the water-ice that lies beneath the surface. One hypothesis is that when the buried water-ice sublimates (changes from a solid to a gas), it forms the troughs in the ice. 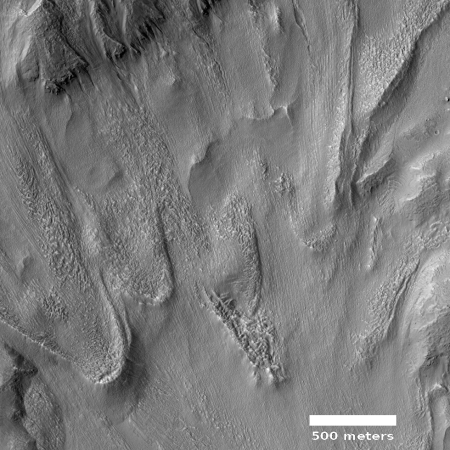 The formation of these features might be an active process that is slowly occurring since HiRISE [MRO’s high resolution camera] has yet to detect significant changes in these terrains. Below is a cropped section of the full image, rotated and reduced to post here. 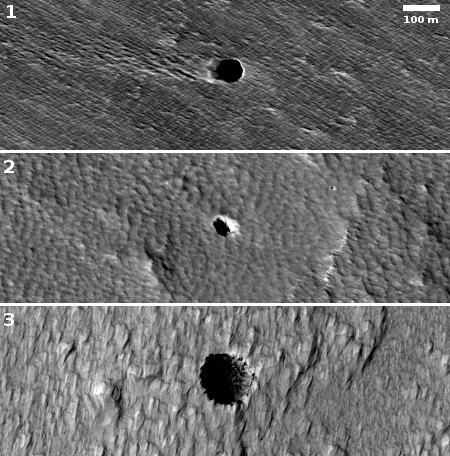 In the past year the monthly image releases from the high resolution camera on Mars Reconnaissance Orbiter (MRO) archive have frequently included newly discovered pit entrances. Each time I have written posts highlighting these new pits, in June, July, November 2018 and January 2019. In fact, this is happening so frequently I could almost label it a monthly update! 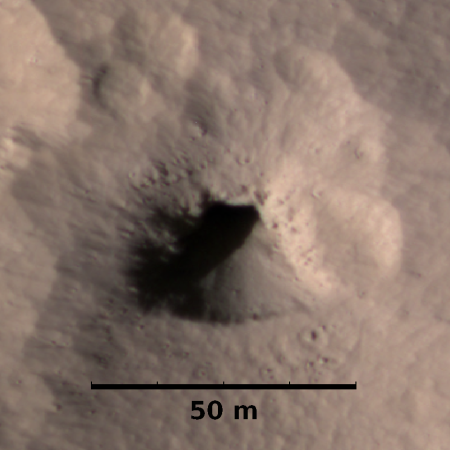 The November release imaged three pits found on the southern flanks of Arsia Mons. 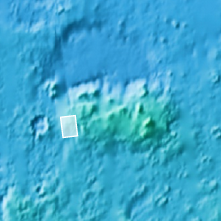 The January 2019 release found several north of the volcano, two of which are very close to the two middle new pits highlighted above. 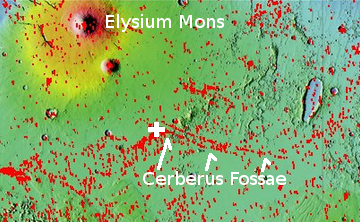 The February release, which is the focus of this post, included four more pits, shown above, all located north and west of Arsia Mons, as shown in the overview map to the right. 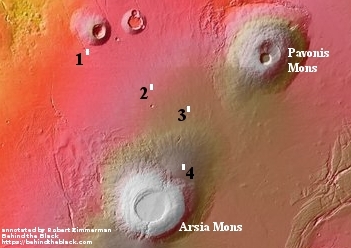 Pits 2 and 3 above appear to belong to a cluster of pits all located in the general area between Arsia and Pavonis Mons. (You can see their uncaptioned releases here and here.) Most sit alone on a flat somewhat featureless plain. 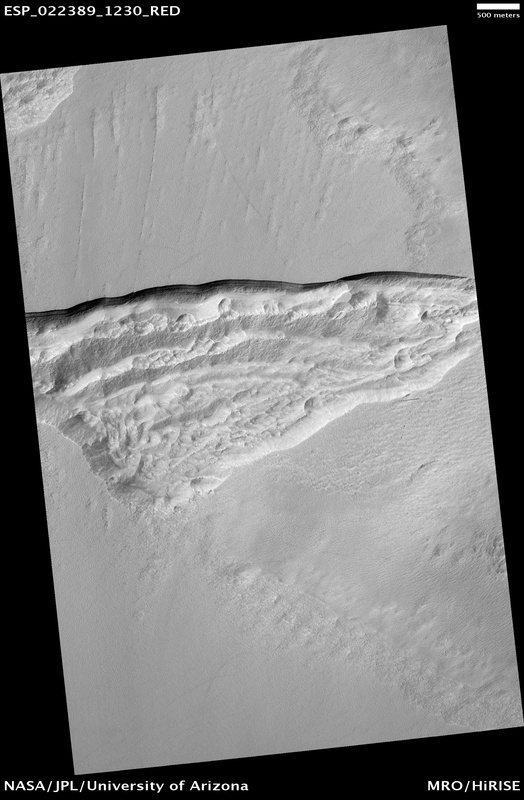 Sometimes there are flow features nearby, but each pit usually seems to sit unique and unrelated to these other faint features. Pit 1 is very intriguing in that it sits amid a very long chain of pits and canyons, all aligned, as shown in the image below and to the right. Time for two cool images! 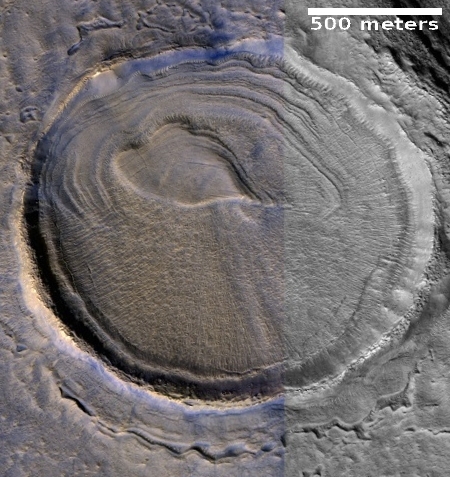 To the right are two images taken by the high resolution camera on Mars Reconnaissance Orbiter (MRO), the top one taken in April 2012, and the bottom taken in December 2018. Both have been cropped and reduced slightly in resolution to post here. The second image is trying to answer, in only a small way, one of the most fundamental questions of the Martian environment: How fast does it change? The images from orbit have periodically seen evidence of new impacts. 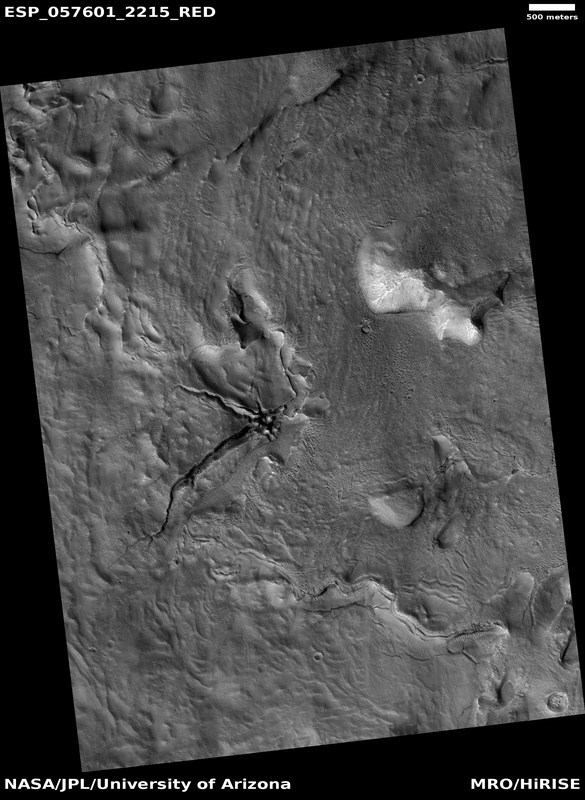 MRO images have tracked dust devil tracks. And we know that somehow water, ice, wind and volcanic activity have eroded and reshaped the surface over eons. What we don’t know truly and with detail is the pace of these changes, with any accuracy. The pace of some things over time seems obvious. 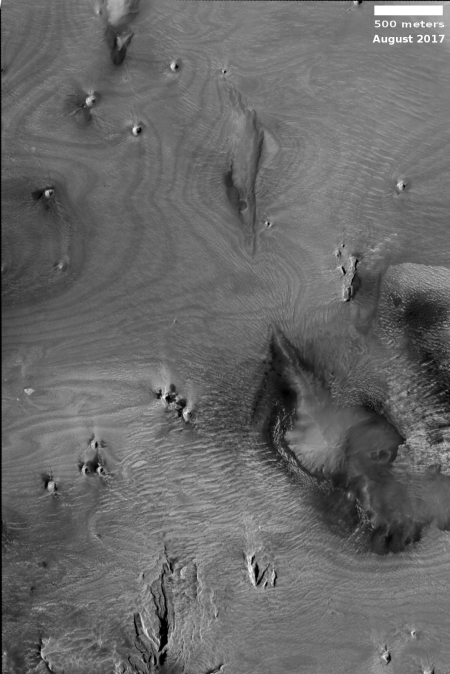 For example, Mars’s inactive but gigantic volcanoes suggest that once volcanism was very active, but over time has ceased so that today it is unclear if any is occurring. Similarly, the geological evidence suggests that in the far past water flowed on the surface, producing catastrophic floods. Now that liquid water is all but gone, and this erosion process as ceased. Cool image time! 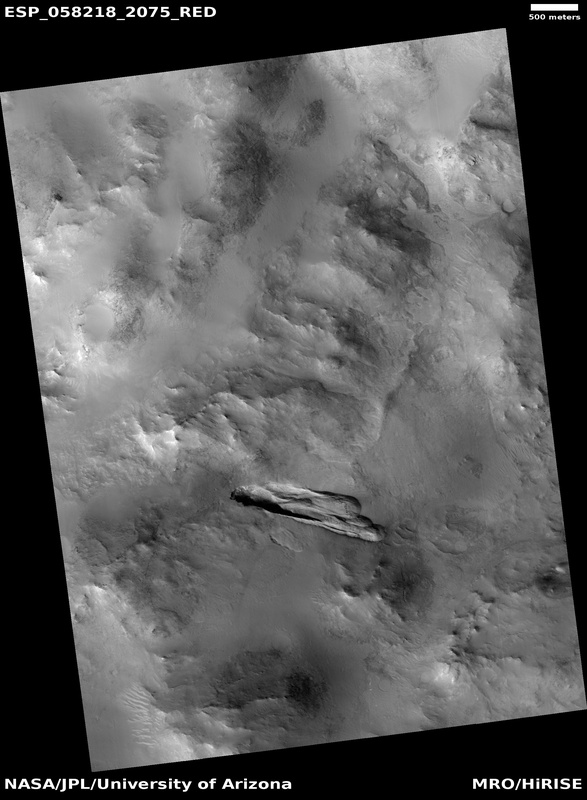 The picture on the right, cropped and reduced to post here, was part of the January image release from the high resolution camera of Mars Reconnaissance Orbiter (MRO). It shows an area in the Martian southern highlands where the surface suddenly gets darker, for no obvious reason. 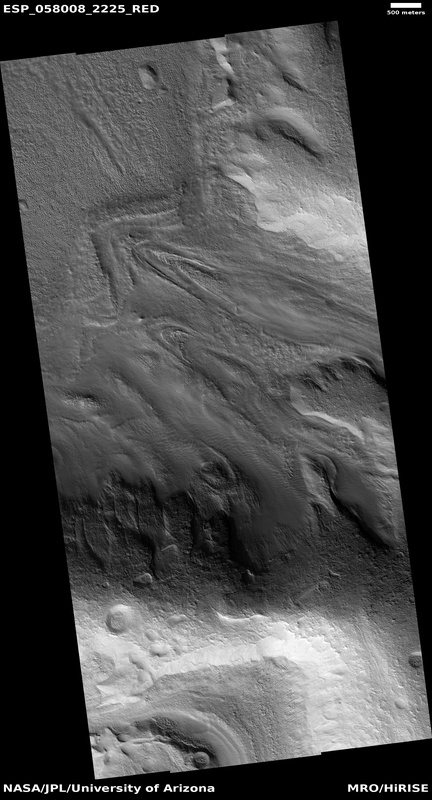 The uncaptioned release image is titled “Dark-Toned Ridge at Junction with Dark-Toned Plain.” From the image itself it is hard to understand this title. 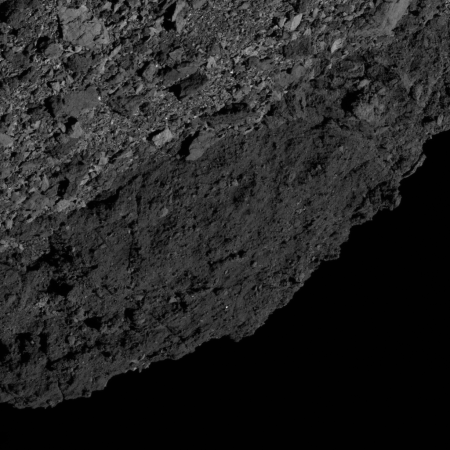 In the full image the darkest terrain is a strip in the center, with slightly lighter dark terrain on either side, and the lightest terrain to the north or south. The photograph however does not show us how far this dark terrain extends to the west or east. 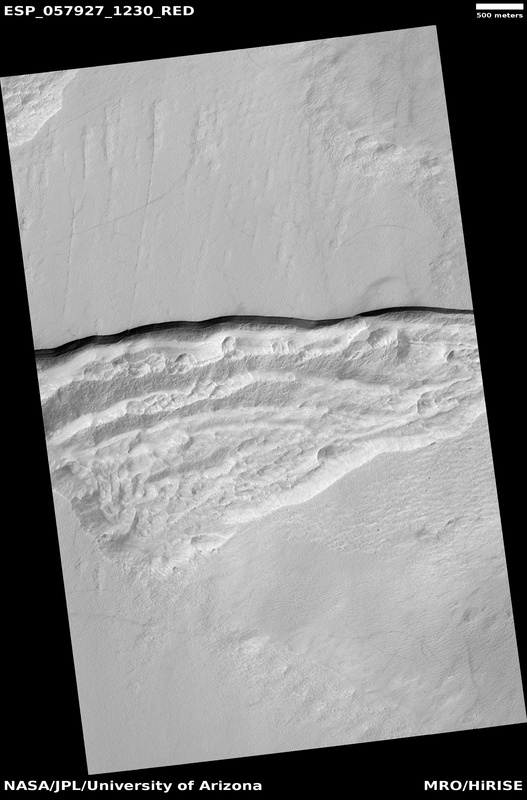 Two Mars Odyssey image strips of less resolution, here and here, show that this region is filled with several large patches of dark-tone surface. With this particular patch the center dark ridge is surrounded by that slightly lighter dark area. 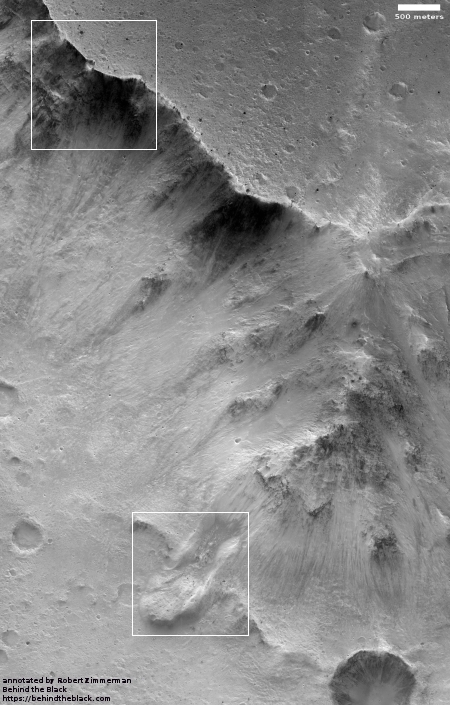 MRO itself has not taken many images of this region, as shown in the overview image below. 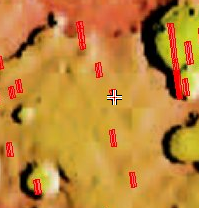 The red rectangles indicate MRO’s high resolution photographs, with this image indicated by the cross. At this low resolution this region seems somewhat nondescript. 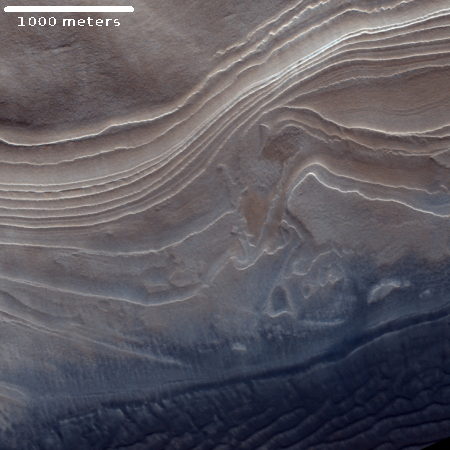 The Mars Odyssey image strips show that there many features here, but with little significant relief. At high resolution there does not appear to be much difference between the darker and lighter areas. The lighter areas in general seem less rough and at a slightly lower elevation, but both areas are dominated by ridges and dunes trending southwest-to-northeast. Why is this slightly higher region darker? Let’s assume that this darker material was a lava flow overlaying the surface. Over eons wind erosion, trending southwest-to-northwest, roughly eroded both it and the lower layers around it, leaving behind this rough corroded terrain. The different make-up of the darker material allows it to erode in a rougher manner. While possibly correct, I would not bet much money on this guess. It is not clear it is lava. It is not clear that it is a flow. It does not explain why there are two areas of different darkness. And it certainly not clear what the make-up of any of this stuff is. 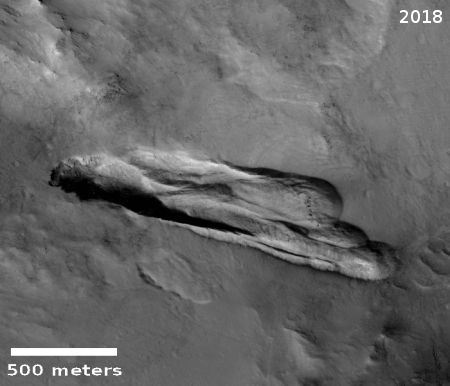 This is simply another cool mystery on the Martian surface. The location for a future Martian colony? Regular readers of this webpage will know that I am a caver, and am fascinated with the pits and caves that have so far been identified on Mars, as illustrated by an essay I wrote only last week. Some of the cave research I have cited has being led by planetary scientist Glen Cushing of the U.S. Geological Survey. Two weeks ago Dr. Cushing sent me a slew of pictures of caves/pits that he has accumulated over the years, many of which he has not yet been able to highlight in a paper. At least two were images that I had already featured on Behind the Black, here and here. One pit image however I had never seen. A cropped and reduced close-up is shown on the right, with the full photograph viewable by clicking on the image. In many ways this pit is reminiscent of many pits on Mars. Its northern rim appears to be an overhang several hundred feet deep that might have an underground passage continuing to the north. The southern lip is inviting in that its slope appears to be very accessible for vehicles, meaning this pit/cave might be a good location to build a first colony. Because of that accessible southern lip, I decided to do more digging about this particular pit. 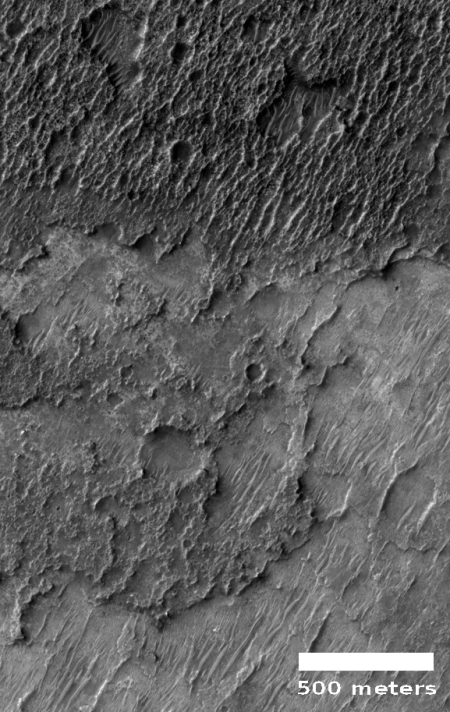 I was quickly able to find the uncaptioned release of complete image by doing a quick search through the image catalog of Mars Reconnaissance Orbiter’s (MRO) high resolution camera. That image, reduced and cropped to post here, is shown below, on the right. Time for many cool images! Over the years I have written frequently about the pits/caves on Mars, in both magazine articles and the many posts here at Behind the Black. 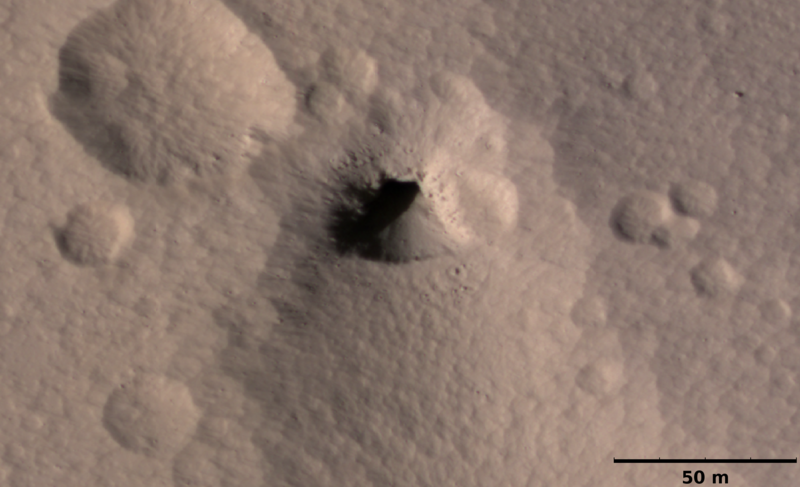 The following posts are the most significant, with the June 9, 2015 providing the best geological background to many of these pits, especially the many located near the giant volcanoes of Mars. November 12, 2018: More Pits on Mars! Rock from Earth, found on Moon? The uncertainty of science: Scientists studying rocks brought back by the Apollo 14 lunar mission have concluded that one sample originally came from the Earth, and if so would be the oldest known Earth rock. The scientists also admit that their conclusion is controversial and will be disputed. If true, however, it suggests that there is significant material on the Moon from the early Earth that can provide a window into parts our planet’s history that are presently inaccessible. The uncertainty of science: For reasons that scientists do not understand, the Earth’s magnetic field has been undergoing unexpected shifts in the past two years, causing its north pole to move significantly and somewhat quickly from Canada across to Siberia. Earth’s north magnetic pole has been skittering away from Canada and towards Siberia, driven by liquid iron sloshing within the planet’s core. The magnetic pole is moving so quickly that it has forced the world’s geomagnetism experts into a rare move. Note that they have delayed the release of the World Magnetic Model until January 30, claiming the delay is caused by the government shutdown. Seems bogus to me. As I have already noted, these scientists aren’t slaves. If they think this is so important, and they have completed their work (which the article suggests they have), they can release the model, regardless of the federal government’s funding. Hat tip reader Stephen Taylor. Cool image time! 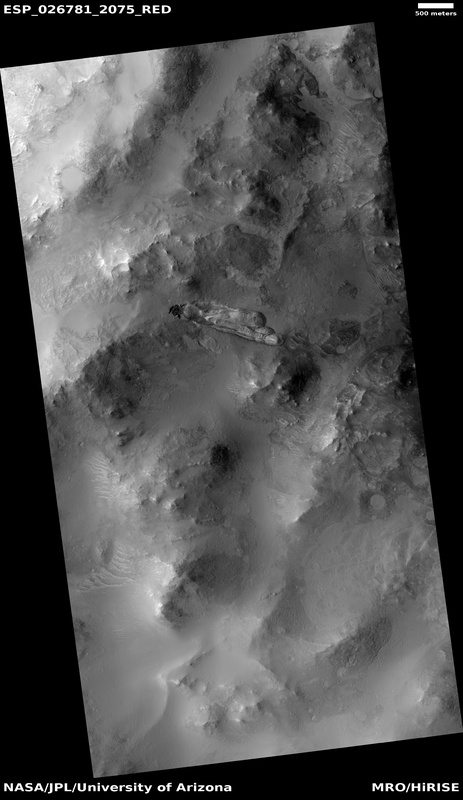 In the November image release from the high resolution camera on Mars Reconnaissance Orbiter (MRO) I found the image on the right (cropped to post here), dubbed “Possible Rock Falls on Steep Slopes in Cerberus Fossae.” You can see the full image by clicking on the photo on the right. The cropped section focuses on the steep cliffs of this deep canyon, formed when lava flowed down from the giant volcano Elysium Mons almost like water, following the faults created by the bulging volcanoes to carve a long series of parallel canyons more seven hundred miles in length. Not only can individual boulders be seen piled up on the base of the canyon, you can see on the lower right a large section of cliff that has broken off and partly fallen, propped now precariously on the cliff’s steep slope. I would not want to be hiking below it at the base of this canyon. 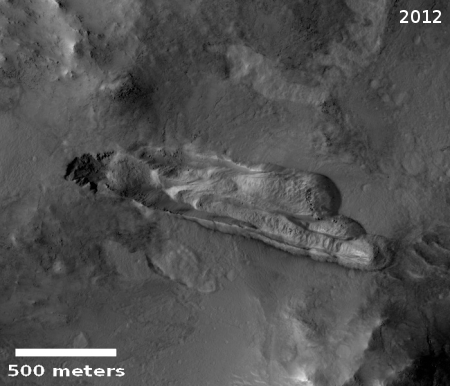 This photograph itself made me more interested in looking at other MRO images of Cerberus Fossae. The context map on the right shows that MRO has taken numerous images along the length of these faults, indicated by the red boxes. The location of the above image is shown by the white cross, at the western end where the canyons tend to be steep, deep, and pronounced. 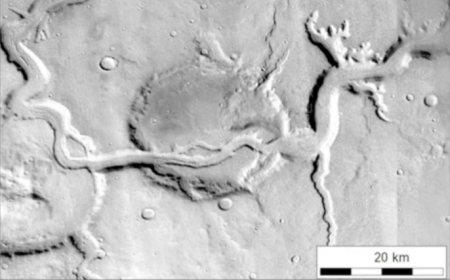 In taking a look at the many images of Cerberus Fossae, I found a variety of canyons, plus pit chains, lava tube skylights, and one especially intriguing image, posted below, that shows what appears to be an extended collapse along the length of what was once an underground lava tube. With InSight’s landing on Mars set for 11:54 am (Pacific) this coming Monday, November 26, 2018, I decided to put together a map of Mars showing the location of all the successful landers/rovers, adding the landing sites for the planned landers/rovers through 2020. This will give some context to InSight’s landing site. The map does not show the landing sites for the failed Soviet, American, and British landers. 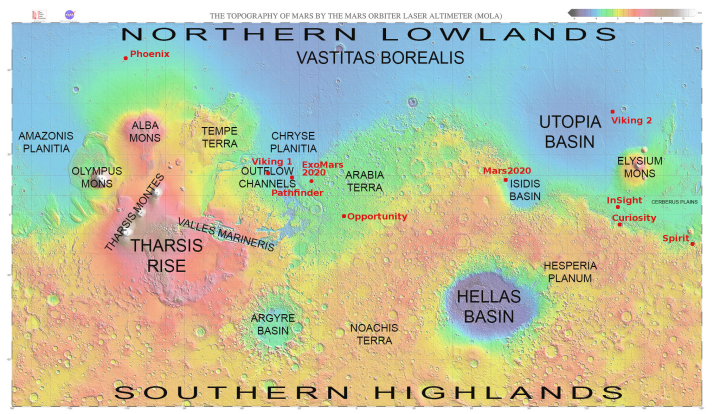 As I noted in describing the Mars2020 landing site, the location of the bulk of these landing sites, along the transition zone from the southern highlands and the northern lowlands, demonstrates the areas of the planet that interest geologists the most. It is here that we find many shoreline features, suggestive of the ocean that many scientists theorize existed intermittently in the northern lowlands. It is here that planetary scientists can quickly gather the most information about Martian geological history. And it is here that they have the opportunity to study the widest range of rock types. From an explorer’s perspective, however, this approach has its limits. It does not provide us a look at a wide variety of locations. It is not directly aimed at finding lower latitude locations where ice might actually exist. And it is decidedly not focused in studying the planet from the perspective of future colonists. I am sometimes frustrated that we have as yet no plans to send any rovers into Marineris Valles, or to the western slopes of Arsia Mons, the southern most volcano in the chain of three giant volcanoes where there are indications that ice might exist underground, or to any of the places where caves are known to exist where a colony could be built more easily. 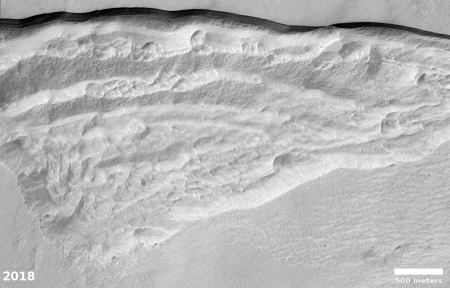 In fact, the caves on the slopes of Arsia Mons seems a prime exploration target. Eventually these locations will be explored, likely by private landers aimed at scouting out locations for future private settlements. I am just impatient.